Or Martini Thyme, as the case may be. Interesting new cocktails as of late. On the left, a vodka-St. Germain-sweet & sour-blueberry-thyme concoction from Firebirds. 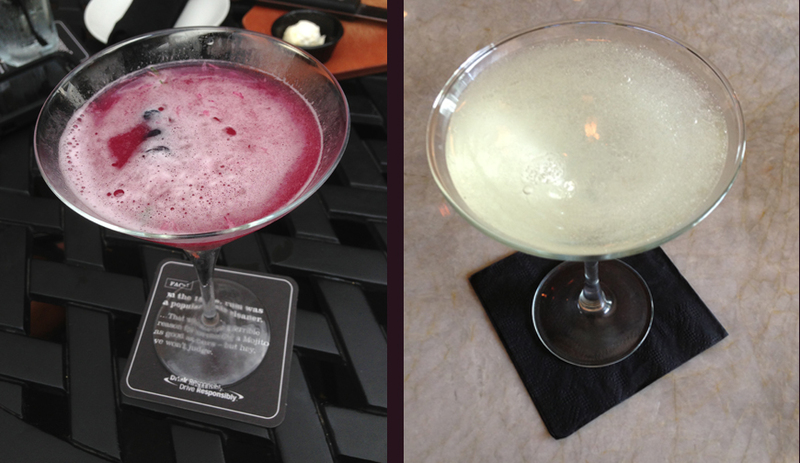 On the right, a vodka-St. Germain-Canton martini from Bar Lucca. Neither of these is necessarily a combination that would have occurred to me, but both of them totally work. This is what happens when you decide to have a little happy hour at home, and the BFF handles food and the P&PDC handles drinks. 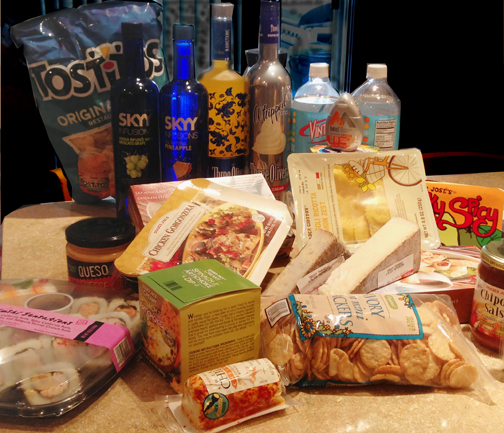 Trader Joe’s provided the food side of things. We tried some new things….The sweet chili goat cheese was nice, and a decent counterpoint to our favorite TJ’s cheese, Toscano. The frozen artichoke dip wasn’t bad, and nukes up in just a couple of minutes. On the drink side, we had the fruit salad drink (posted here), but the BFF prefers it with sparkling clementine juice rather than OJ. We also tried a confection of pineapple vodka, whipped vodka, orange Mio, and mandarin orange seltzer. The seltzer is absolutely necessary….otherwise, it’s just too too sweet. Shake it up with ice and enjoy. We recently discovered that Skyy is making a Moscato grape vodka. What to do, what to do? Well, mix it 1:1 with no pulp OJ, that’s what. It tastes like neither grapes nor oranges, but some delicious blend somewhere in between. Recently, the Pub at Wegman’s had BBQ week. The food, quite frankly, was a little disappointing. 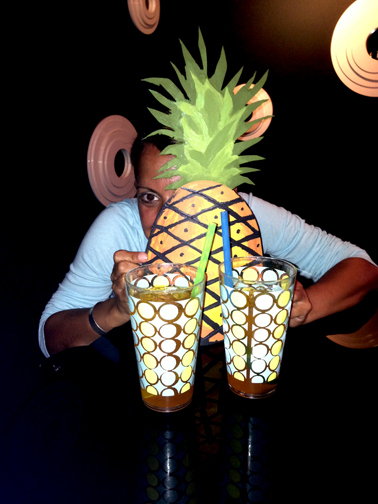 But the cocktails….that’s a whole other thing. 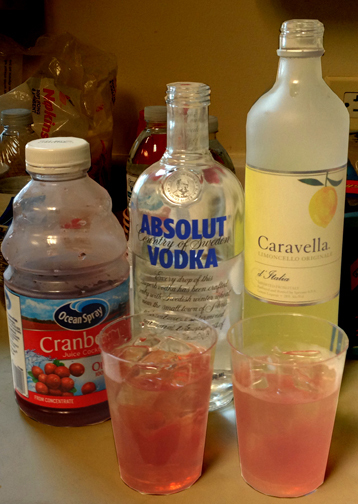 For me, their riff on the blueberry vodka-lemon theme that we’ve been enjoying all summer. 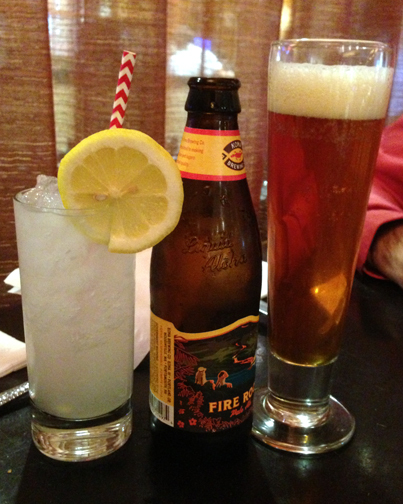 For my dining companion, Kona Brewing Company’s Fire Rock Pale Ale.